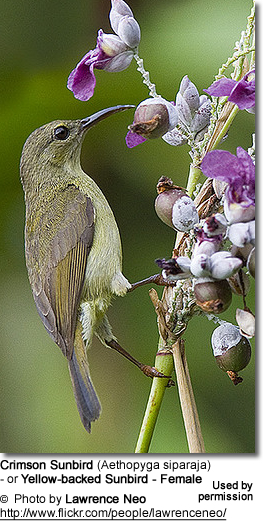 The sunbirds and spiderhunters are very small birds that mostly inhabit forested areas, however, some subspecies occur in patches of vegetation in deserts. 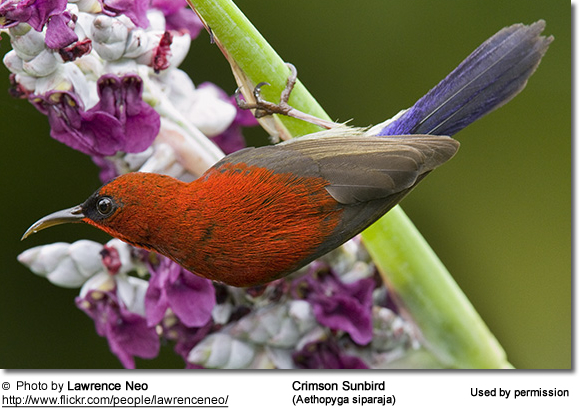 The sunbirds are distributed in tropical Africa and the forests of southeast Asia, including the Greater Sundas and the Philippines. Most species are found in Africa. 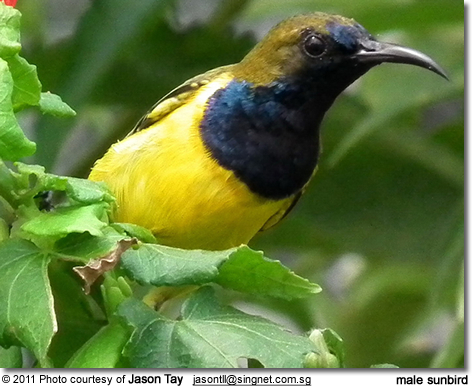 Sunbirds are sedentary or short-distance seasonal migrants. 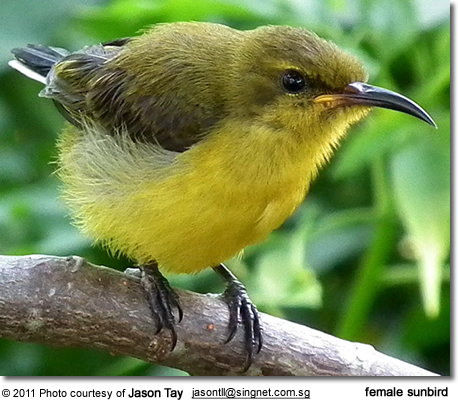 Sunbirds are strongly sexually dimorphic. The adult males usually have brilliantly colored plumage, while the females and the young are duller in coloration. 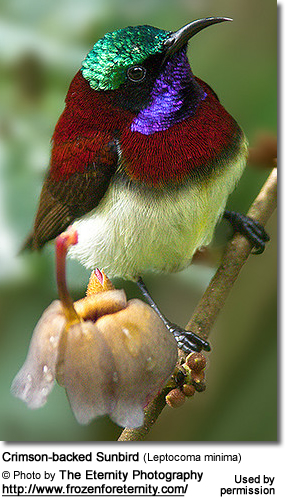 Sunbirds have long thin down-curved bills and brush tipped tubular tongues - both adaptations to their nectar feeding. 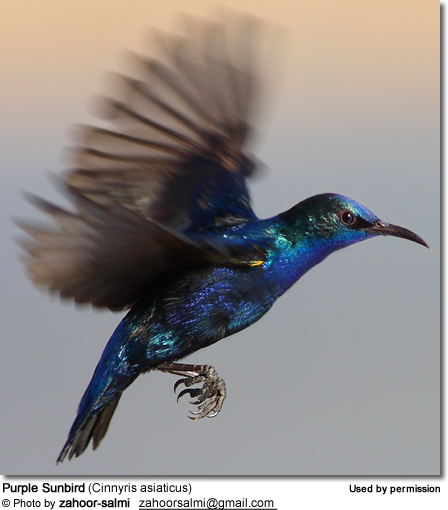 Sunbirds mostly feed on nectar, although take insects particularly during the breeding season to feed their young and to satisfy their own need for increased protein in their diet during this demanding time. 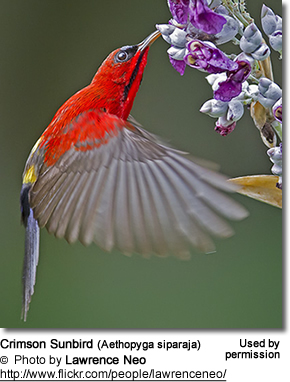 Even though sunbirds can take nectar by hovering like a hummingbird, most usually perch while taking nectar. 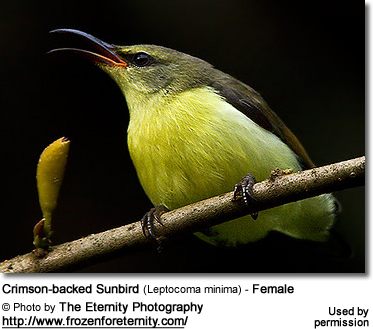 Sunbird pairs build the purse-shaped, moss-covered nest together - although the female takes on the part of lining the nest. The nest is often suspended from the underside of large fern fronds, or thin branch of a low tree or shrub. A clutch consists of 1 to 3 eggs (average 2) which are mostly incubated by the female for about 18 - 19 days. The male assists with feeding the young.